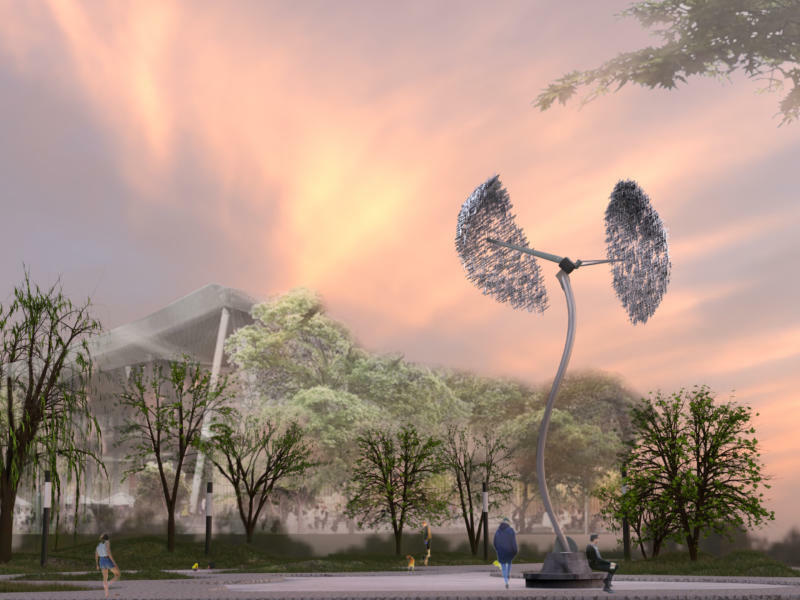 Over the last year, Burning Man Project has collaborated with Google on the plan to install five artworks in the new public Charleston East Plaza in Mountain View, California. Through an international call for artists and a six-month art review and community feedback process, we first narrowed the submissions down to the 45 semi-finalists shown below, then ultimately to the five finalists. 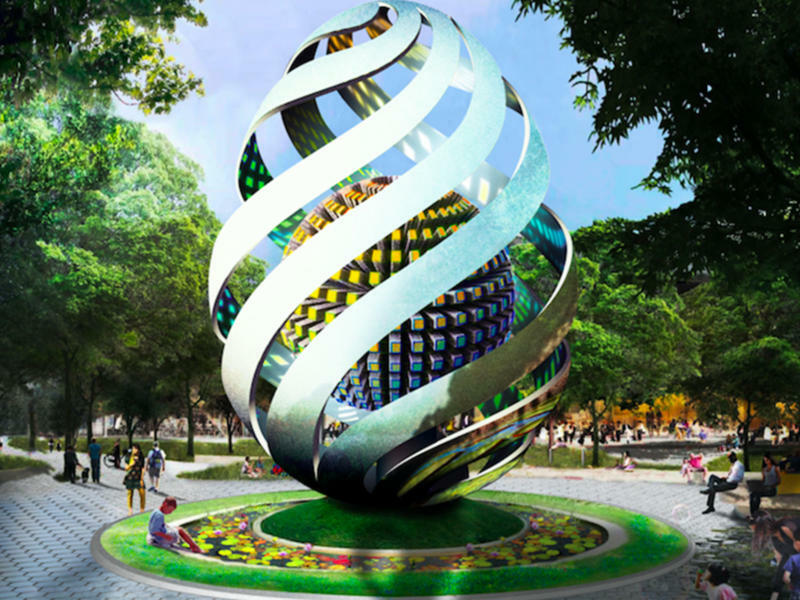 The artworks will be fabricated in 2019 and installed in 2020. For those interested, there will be opportunities to help with some of these projects. Stay tuned for more details, as well as the opening celebration of Charleston East Plaza later in 2020. Questions? 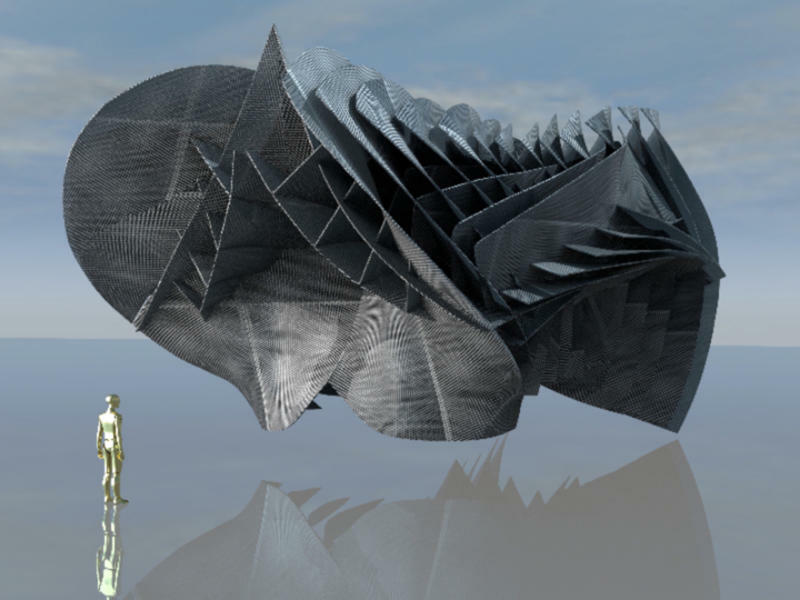 Find out more about the project, explore the Location Map, or contact us at ceplaza@burningman.org. Magic Carpet, an interactive canopy of pixels, connects participants and their environment through play, wind-driven motion, and augmented reality. Drishti, “concentrated gaze, (in)sight”, a mosaic reflection of individual perspectives, a focus and locus to elevate collective vision. The Eye at night showcases the kaleidoscope in full effect; images from the surrounding campus are transformed into a delightfully playful experience. “Veracity” designed with Google Tilt Brush technology, is a sculptural metaphor for Google -- embodying a new way of creating culture. Monumental mountain lion sculpture of aluminum plate & tubing with water-jet cut symbols denoting lines of computer code, programmable LED lighting. The Crystal Spire seen in the day. Inside the transparent, triangular panels are 48,000 LEDs facing both inward and outward, that come alive at night! A larger-than-life möbius strip of laser cut stainless steel with a curvilinear surface, playful seating, dynamic lighting, and space to gather. 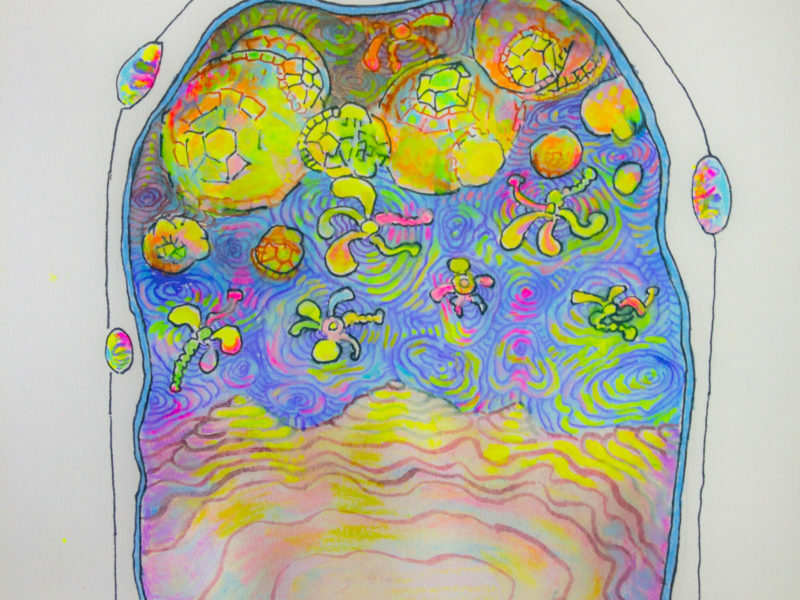 The theme is global awareness, and the concept pattern includes abstractions of essential elements of life on earth: sun, water, air, sustenance. We view technology and spirituality as opposite ends of the spectrum, but what if they’re connected? 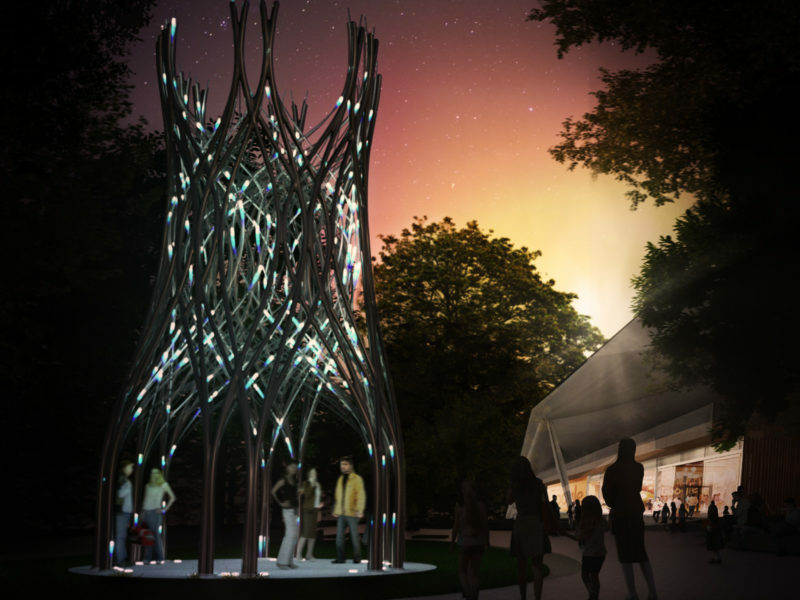 ASPIRE is a monument, a beacon, a gathering space -- for visitors to explore and interact, with shade during the day and a light show at night. Sparkling garden turned gathering & meditative space, captured in a grain silo. Elemental hand work illuminated with high technology. Elements is an accessible landscape of dichroic mirrored platforms reflecting the sky by day, illuminating in full interactivity by night. DataClouds’ thousands of brightly polished “data” bits form two graceful “clouds” 46 feet overhead -- kinetic sails creating ever-changing visuals. Like networks of connections, constellations of bioluminescence; Every one of us a world; And a world in every drop; Together, a sea of connections. Forum is meant to be both an iconic and recognizable structure on the campus and a space to rest, exchange, reﬂect, or simply pass through. Emerging from the deep. Architeuthis; a colorful sea-creature swimming alongside the promenade with giant eyes and suckers ominously glowing at night. The Burrowing Owl and Google share the ability of making the unseen seen. This project symbolizes Google's ecological vision for livable landscapes. Rockspinner is a physically engaging and playful art piece — a large, natural, multi-ton boulder that you can easily spin with a single push. We are lifted by the hands of giants to make new discoveries and build a better future for all humankind. Lamina is an 11-foot tall sculpture formed from ellipsoidal aluminum rings, shown here illuminated with vertical lines of white LEDs. 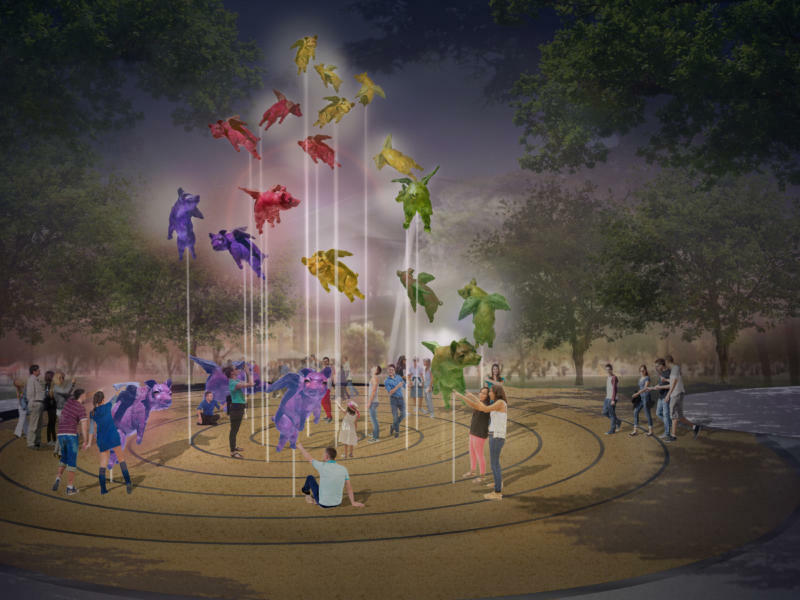 Portal is an interactive canopy where pixels connect participants to the physical environment through play, wind-driven motion & augmented realities. (NN) Neural_Nimbus. Kinetic sculpture with augmented reality surround 'world' that employs machine learning, crowd source and climate data to evolve. A family of autonomous robot gardeners continually rake paths and patterns in the sand in response to online activity and local interaction. ""Curious"" A grizzly bear, but also a metaphor for Californians who are changing the world." 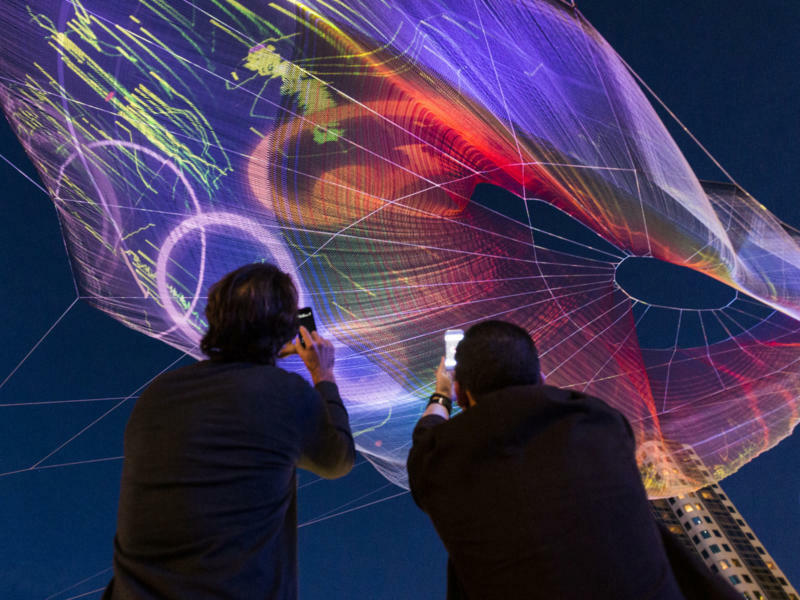 Floating aerial sculpture with interactive lighting component. Bayshore Bird is a symbol of freedom and perspective that brings awareness to restoration efforts of the native ecology surrounding North Bayshore. World’s First Public Art of Machine Learning and AI-based astronomical research through open source NASA data and Tensorflow research models. Caducean, a totem in homage to interconnecting the universe. The EGG is the origin of Life, Cosmos and Creation. Mind and consciousness resonate with the spiralling light, harmonize with new world joy and hope. s i n g u l a r i t y³: a conceptual re-envisioning of “singularity” as the simultaneous evolution of three realms: Technology, Humanity and the Earth. Treehive shows the evolution of material science and mankind's interconnectedness with technology that spans thousands of years of human development. Imagine you are looking up at the bottom of the ocean -- a sculptural map of the exact opposite side of the world, the Indian Ocean’s seafloor. Podolous is an interactive sculpture resembling a colony of cells with a tactile interface that activates varying patterns of sound and light. Centaurs are metaphors for our mixture of animal and human natures. Dionysian revelry mixed with intellectual curiosity drives us forward. 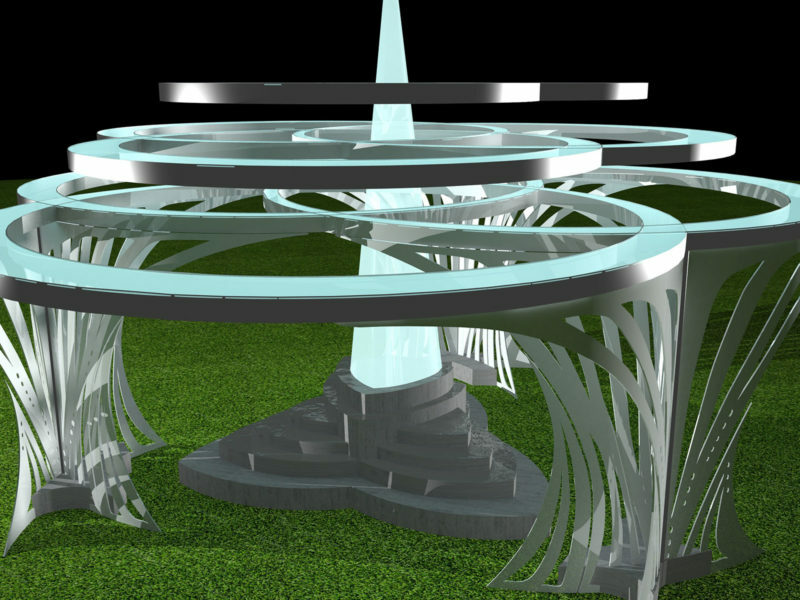 The anchor artwork is a nimble architecture of experience and light, a system of many parts in ultra-thin aluminum, based on computational protocols. Inspired by the artist’s background in quantum physics, a figure holding a tablet virtually disappears when viewed along the direction of her gaze. “Go” is a no-tech tactile display system that allows visitors to compose large-scale images and text by manually flipping double-sided discs. Lightlines is an immersive artwork that translates real-time data & visitor interactions into dynamic streams of colored light, sound & geometry. By day, FLUTTER is a place to meet, talk and think. At night, FLUTTER becomes a celebration of wind, lighting up from within. 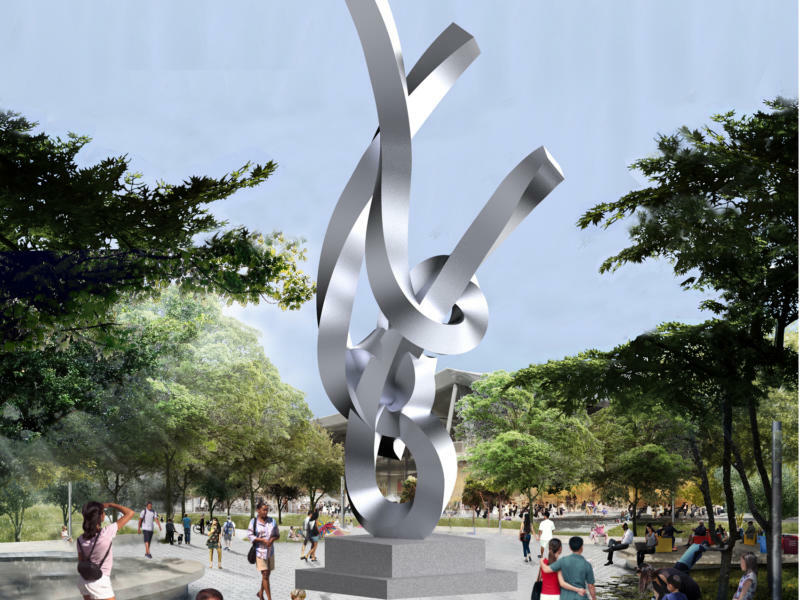 “Reaching for the Sky” is an uplifting sculpture focusing upon the inspiration and innovation of the tech industry always reaching for higher goals. Particle Trap, as viewed from Charleston Road. 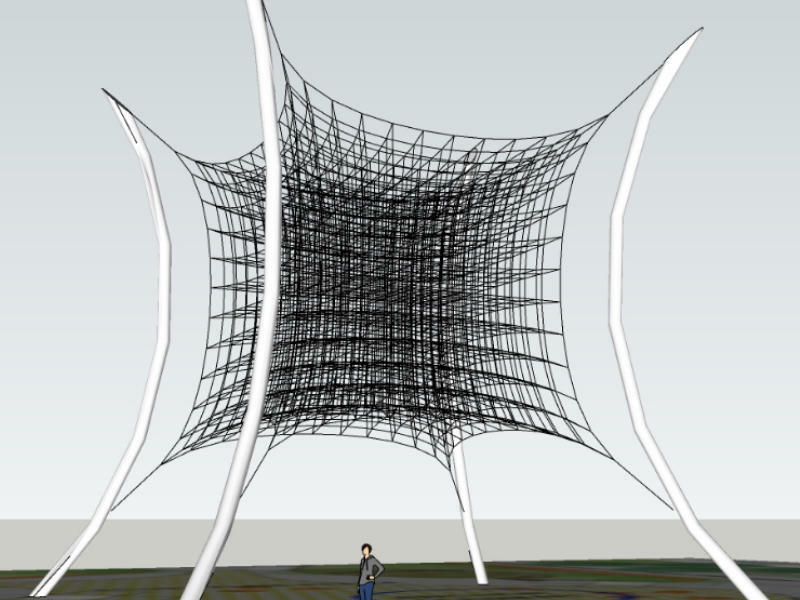 Illustrates the complex yet elegant geometry of the sculpture’s curved support columns and cable grid. DREAMER is a fairy tale tree come to life. The polished stainless steel trunk holds copper cube leaves with interactive tinkling metal chimes. Spirole is a kinetic installation that fuses art and engineering, inspired by the forms and motion principles of marine feather duster worms.